This past weekend we noticed that our asparagus has finally broke ground and in the past 3 days the asparagus has shot up towards the sun quickly. There are 2-3 that have popped up and one of them is already about 4 inches or so. Now we learned since planted that you do not harvest asparagus the first year and sometimes not even the second year. By the third year you have a nice crop of asparagus. Talk about long-haul. Damnit. I like instant gratification. when do you harvest asparagus from your garden… grab a chair. It is going to be a while. Safely, you will be harvesting your asparagus crop on year 3. 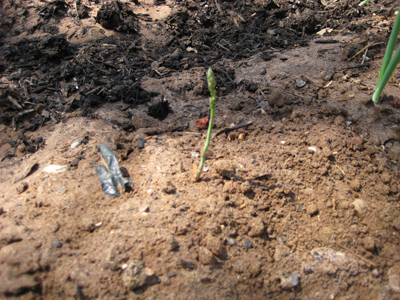 Check the pictures below of our baby asparagus sprouting up, sorry the quality isn’t awesome – camera wouldn’t focus on it. My apologies to you asparagus lovers. Previous Previous post: Knock-off Crocs & Watering Can to Match!